I am a fan of bareminerals foundation for a number of years and I have never looked back. Its powder foundation does not break me out and improves my skin texture. About two years ago, my sister had a friend who was travelling to USA. So I got her friend to help me grab a few pots of the bareMinerals foundation and products. 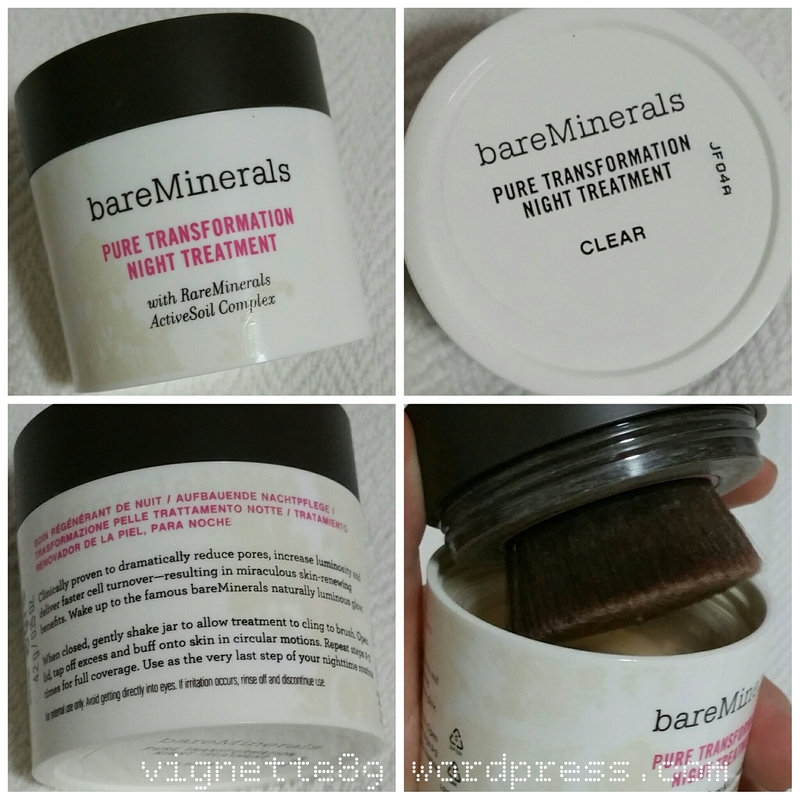 One of the purchases is this Pure Transformation Night Treatment. I followed the instructions and dust on this product after my 3 step skincare. I had chosen the shade Clear because I don’t want to risk rubbing the product on to the pillow. I slept with this product overnight and noticed that my T-zone does seem to product less oil in the morning, and I seem to have this dewy and ethereal glow on my face after 1 night of use. The small pimples that was there the day before also seem to dry up a little (its like i had foundation overnight). My skin does not feel dry in the morning either. I can’t find this in Singapore even today. Its not available in Sephora either. There was once where I thought I saw a few bottles of the product at Sephora but it quickly disappeared and I do not get to see it again. So the only way is to purchase through friends who are travelling to USA or UK (as far as I know) or to purchase through 3rd party sites such as Strawberry Net, Taobao, Beautybay.com and Feelunique.com or Lookfantastic.com. I have this Tarte Blusher for some time and this I must say it is a prized purchase because the colour lasts for at least 6 hours when I am indoors in sunny and humid Singapore. I am using Dollface and this is definitely my favourite blusher for now! Not only does it last for hours without fading (well unless you rub your cheeks from time to time and that will certainly rub off the colour). I have used bare minerals blusher but the staying power is not as long. I work on average 9 to 12 hours a day and I have normal to oily combination skin. Its just amazing to still be able to see the blusher on my cheeks after such long working hours. What’s more, I am able to gradually layer on the blusher for darker shades – unlike some other blushers that I’ve used where it can look too dark when I dust on another round of blusher. 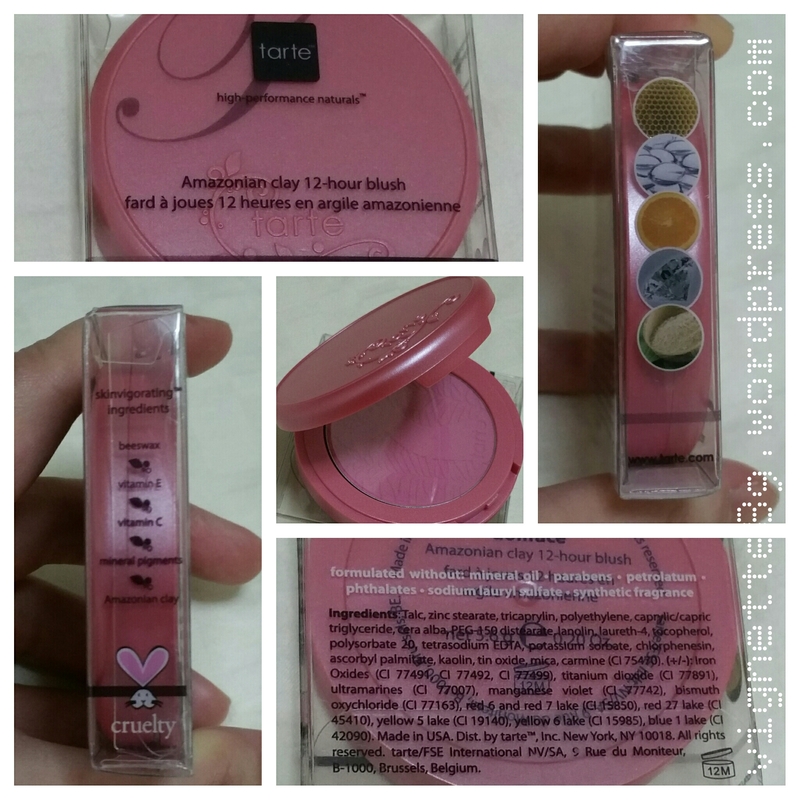 Its great for creating naturally pink cheeks! *love it love it!! * Oil control wise, I am not sure coz my face can get really oily – and I attribute it to dry airconditioning and not drinking sufficient fluids in office. But overall I still think this is THE BEST mineral blusher – ever! Two places: your nearest Sephora and Tarte Cosmetics website! Are you a tartelette too? Tell me about your experience with the Amazonian Clay Blush!